Until recently, farm-to-table is a term that many people would not recognize, but nowhere has it gained more momentum than in Boulder. The natural food movement here is thriving with new companies, farms, and organizations sprouting up practically every day. One can hardly walk into a store or establishment without noticing labels boasting “organic,” or “locally grown,” and the community is rallying around the sustainable practices that make this town a forerunner in healthy living. Perhaps this kind of support is why Black Cat Farm To Table Bistro, aptly named for its location on “lucky” 13th Street, has gained so much notoriety. Rumors abound of this quaint little eatery that is rustic yet swanky, original yet down-home, innovative yet traditional. Chef Eric Skokan and his wife Jill opened the restaurant’s doors in 2006 after establishing 120 acres of organic farms and pastures to supply 85% of every morsel served. Each day the duo and their team harvest fresh produce with which they concoct new flavorful dishes for the evening’s diners. Changing the menu every single day can’t be easy, but having over 400 animals and 250 varieties of fruits and vegetables to choose from probably helps. No longer able to resist the allure of the Black Cat motto, “A memorable meal begins on the farm,” my husband and I finally decided to see for ourselves what all the fuss is about. We were not disappointed. Immediately upon entering I can sense the cozy elegance that defines the Black Cat. 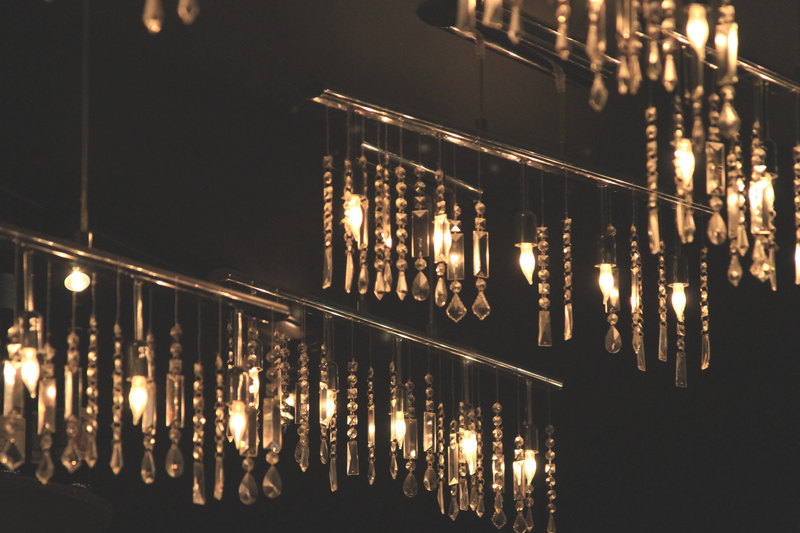 Crystal light fixtures dangle like stalactites over crisp cream tablecloths and black leather sofas shrouded by sheer curtains. The open kitchen is clean and quaint with shelves strategically cluttered with books, spices, and pottery reminiscent of something you would find in your own grandmother’s house. Even the bathrooms balance the charm of a fine establishment with farmhouse flare, the walls bedecked with farm animal calendars in wooden frames and the soap dispenser disguised in a mason jar. 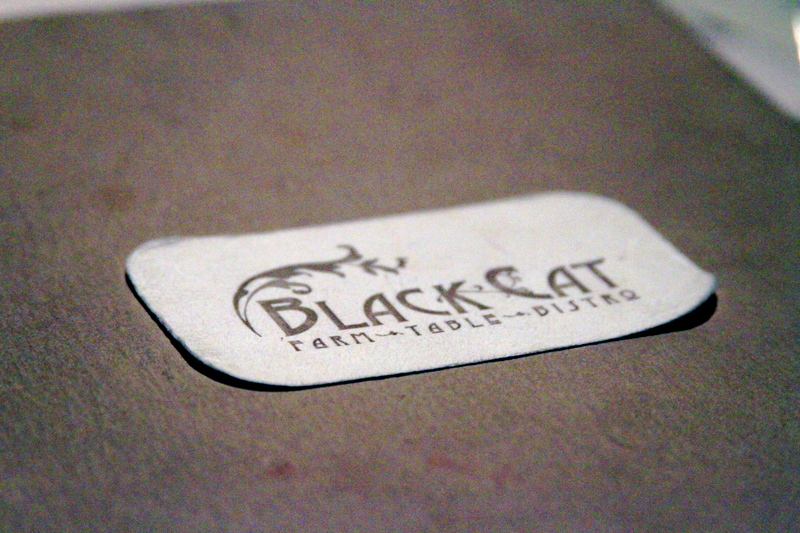 Busy wait staff smiles at us as we are ushered to our table where our friendly server relates the familiar story behind the Black Cat’s inception and practices. After quickly perusing the night’s menu, even I—a self-proclaimed foodie with zero training in the culinary arts—can see why the Wall Street Journal praises the food’s “serious sophistication.” It is hard to resist the temptation of the decadent feature items such as yellow tomato and spaghetti squash soup with tarragon and candied citrus, or quail farci with lentil fritter, raita, roasted sunchoke and Anaheim pepper salad. But, at the behest of my ravenous husband and the expert advice of our waiter, I forgo the mouth-watering item descriptions and consent to the mysterious four course tasting menu with wine pairings. The first is a small appetizer plate with intricately placed bite-sized morsels of tender Mulefoot Pork belly and radish, roasted beet and creamy textured ricotta salata, and a sensational sipper of butternut squash soup with parsley oil. The aperitif accompaniment is a sparkling Asprinio from Campania with a sugar cube soaked in Fernet by the Leopold Bros. of Denver, giving the drink a refreshing minty taste. The next course is a beautiful arrangement of beet and chocolate macaroon with eggplant puree and foie gras torchon cured with brandy—a startling combination of bitter and sweet with a spicy kick. 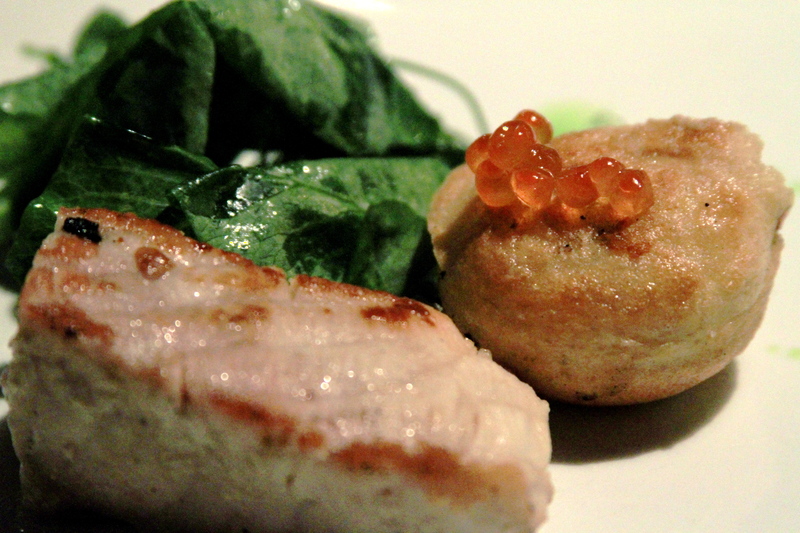 The rich and buttery 2001 White Bordeaux by Chateau Chantegrit is a perfect pairing with the dish’s explosive flavors. This is a perfect example of how the Black Cat combines produce from their own farms, taking advantage of the deep-colored eggplant and beet, which are now reaching their seasonal expiration date. The chefs are able to navigate the changing seasons and the vegetables that come with them via 250 varieties of heirloom and heritage cultivars. 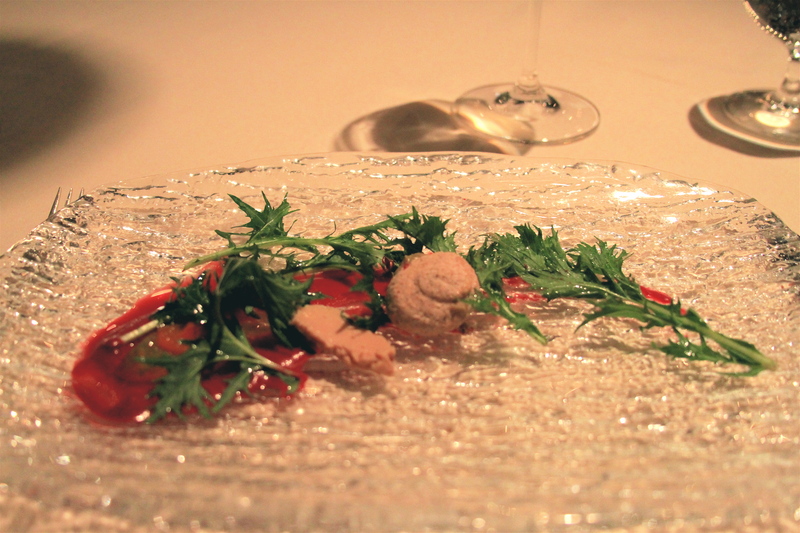 Course number three ignites my taste buds before the plate is even set in front of me. The Sicilian wine, made by 29 year-old Arianna Occhipinti, is a flavorful balance of earthiness and fruitiness, which the sommelier refers to as “double intensity.” The pairing selections are impressive, not only because I find them tantalizingly delicious, but because the restaurant selects wines almost exclusively from small producers specifically to enhance their dishes. This wine is a perfect bright addition to the succulent grilled Sturgeon, so immaculately prepared that it seems to melt in your mouth. A topping of Salmon roe gives a harmonious salty kick to the bite-sized potato pancake, and the small side of Poblano leaf salad tastes like ripe sugar snap peas making it impossible not to imagine oneself on the farm where it was harvested mere hours ago. Having rarely indulged in such extravagant dining experiences, I detect the anxiety in my husband’s expression as he mops up the last crumb of pancake; although the delicately portioned courses have been most pleasing to the palette, they have not quite satiated his hunger. However, a look of complete relief overcomes him as the waiter replaces our used cutlery with steak knives and introduces the final course of beef scaloppini with truffle spaghetti squash and bone marrow-infused marshmallow. Spaghetti squash, another seasonal favorite, is a versatile low-carb, low-calorie root vegetable that is easy to store and transport–another major consideration when Chef Eric and his team are harvesting for the night’s menu items. Additionally, the beef is chosen daily from over 400 animals served at the restaurant including Tunis and Karakul Sheep, Mulefoot Pigs, Freedom Ranger Chickens, and Heritage Turkeys and Ducks. Just when we thought it couldn’t get any better, the waiter brings us an unexpected sugary fifth course. No, not one of those miniscule chocolate mints that come with the check. Out comes a full on dessert: chocolate flan with orange slices, citrus dust, crunchy chocolate crumbles, and fudge sauce with a healthy glass of Quinta Infantado Portugal Port to boot. Though I am no farmer, nor an expert in seasonal produce, I do not exaggerate when I say that you can truly taste the “farm-to-table” difference. For those willing to do a bit more research, the Kokans encourage you to get out to the farm and see for yourself, or you may decide to check out a sheep shearing or harvesting sideshow. They also offer catering on and off site for those wishing to impress a crowd. On a tight budget? The rumors are true: Black Cat is not cheap! But, you can still experience delicious locally sourced foods from the Bramble Hill Farmstead at the Black Cat’s sister restaurant, Bramble and Hare, which opened in July of this year. I have personally not been, but hear its rustic dishes are tasty, and better yet, its casual atmosphere can be enjoyed until 1:30am every night of the week! My husband and I leave the Black Cat with heavy stomachs and significantly lighter wallets, but every bite was worth every penny—a satisfying and memorable experience I would recommend anyone try at least once. *Author’s note: Chef Eric Skokan is currently featured in Sunset Magazine, and was also recently featured in the Wall Street Journal on 10/19/12! Check out the article here.